Context: The magnitude and severity of oral health problems in visually impaired population are worse than in general population, and they tend to have more untreated dental diseases and more problems accessing dental care. Aims: The aim of this study is to assess dentition status and treatment needs, oral hygiene status, and traumatic dental injuries among institutionalized children attending special schools for the visually impaired in eastern Odisha. Settings and Design: A descriptive, cross-sectional study was conducted using a universal sampling protocol. Subjects and Methods: American Dental Association Type III clinical examination was carried out using plane mouth mirrors and community periodontal index probes under adequate natural illumination by a single examiner assisted by a trained recording assistant. After completion of the study, all participants were provided with basic oral health care through outreach programs. Statistical Analysis: Comparisons were done using Student's t-test, analysis of variance, and Chi-square test. Results: Caries prevalence for primary and permanent dentition was 15% and 46%, respectively. Mean oral hygiene index-simplified (OHI-S) was 2.43 ± 1.03. The prevalence of traumatic dental injuries was 11%. A statistically significant difference in mean decayed, missing, and filled teeth (DMFT/dmft) was observed in children consuming liquid sugar as compared to solid and those consuming sticky sugars as compared to nonsticky. A statistically significant difference in mean OHI-S scores was observed when compared with frequency of changing toothbrush. Conclusions: This sample of visually impaired children has a high prevalence of dental caries, traumatic dental injuries, and poor oral hygiene. Unmet needs for dental caries were found to be high indicating very poor accessibility and availability of oral health care. Background: The problem of early childhood caries remains a worldwide public concern, as most of the caries remains untreated. Despite advances in dental care, most children fail to benefit from oral health-care services not only due to differences in attitudes in parents but also in oral health-care providers. Objectives: The objective of the study is to determine the road blocks perceived by the dentist in Chennai, toward the treatment of early childhood caries. 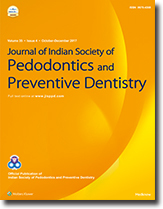 Methods: Following a simple random sampling technique, a cross-sectional questionnaire study was conducted among general dentists (n = 50) and pediatric dentists (n = 50) in Chennai city. Each selected dentist was asked to complete the Barriers to Childhood Caries Treatment (BaCCT) questionnaire: a 29-item measure considering child, parent, dentist, and healthcare system factors. Results: The mean BaCCT score was found to be significantly higher among general dentists 2.68 ± 0.36 when compared to pediatric dentists 2.36 ± 0.45 (P = 0.0001). Similarly, mean BaCCT score was found to be significantly higher among general dentists in Domain-I (child coping abilities), Domain-II (dentist attitudes toward offering restorative treatment), and Domain-III (dentist attitudes toward restoring primary teeth) when compared to the pediatric dentists (P < 0.001). Conclusions: The general dentists exhibited inherent barriers in providing treatment for early childhood caries compared to pediatric dentists. Training in the field of pediatric dentistry enhances their ability to handle early child caries better. Background: Early childhood caries (ECC) is characterized by the presence of one or more decayed, missing (due to caries), or filled teeth surfaces in any primary tooth, in a child below 6 years of age. Although ECC is primarily associated with high levels of maternal Streptococcus mutans, there has been an increased interest in finding the relationship between oral fungal flora and dental caries. Objective: The aim of the study is to identify and characterize the Candida species and to compare the candidal isolates in children with ECC and without ECC. Materials and Methods: The study was conducted on children below 6 years of age, who were categorized into ECC and non-ECC groups of fifty children each. 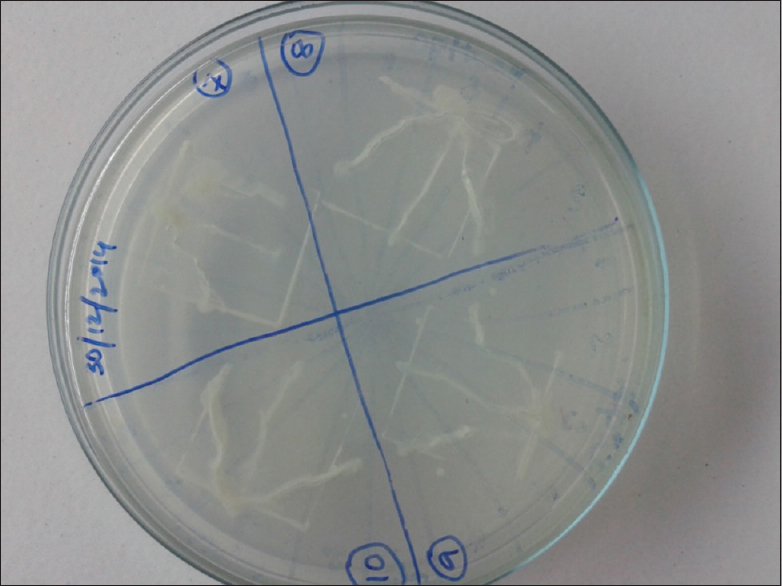 Samples were collected using sterile cotton swabs and were inoculated on Sabouraud's Dextrose Agar and incubated at 37°C for 24 h. Candidal colonies were isolated, species identified and virulence factors tested for both ECC and non-ECC groups. Results: The candidal carriage among the ECC children was found to be 84%, which was significantly higher than the non-ECC group of 24%. Candida albicans and non-albicans Candida (NAC) were isolated in both ECC and non-ECC groups. Phospholipase production was significantly high in ECC group whereas hemolysin production and germ tube formation showed no significant difference between the two groups. Conclusion: A significant correlation was found between the presence of Candida and ECC. NAC also plays an important role in the development of ECC. The virulence factors such as phospholipase may be responsible for the pathogenicity of Candida in the development of ECC. Aim and Objective: To estimate the accuracy and assess the sensitivity and specificity of direct visual examination (DVE), computerized radiograph (VISTA SCAN mini), and DIAGNOdent (DD) for caries diagnosis in primary molars as compared to histological examination of the teeth. 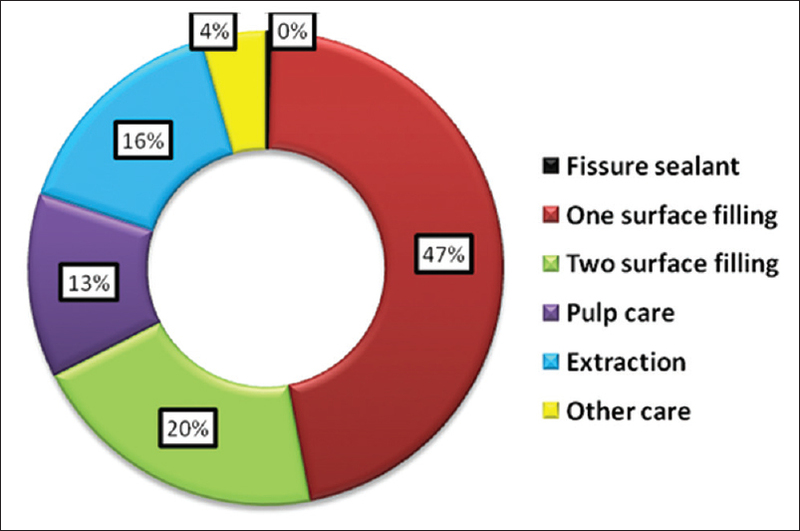 Materials and Methods: An in vitro comparative study was carried out on 40 freshly extracted primary molars with questionable pit and fissures that yielded 89 examination sites. These samples were mounted on plaster and were subjected to examination methods for caries detection on the occlusal surface by two trained and calibrated examiners. 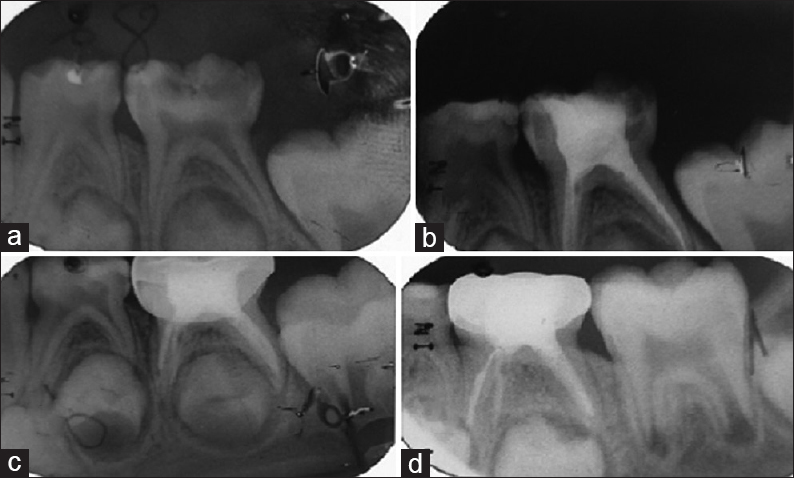 The examination methods used in this study were DVE, computerized radiographic (CR) examination, laser fluorescence examination using DD followed by histological examination which is a gold standard; later, these samples were examined under microscope for caries extent. The scoring criteria given by Nytun et al. were used in this study for scoring the extent of caries. Results: The sensitivity for caries in enamel were 66.10%, 52.86%, and 54.17% for DVE, CR, and DD, respectively, while the specificity for DVE, CR, and DD were found to be 86.67%, 68.42%, and 76.47%, respectively. For dentinal caries, sensitivity for DVE, CR, and DD were 86.67%, 92.86%, and 81.25%, respectively, while the specificity were 66.10%, 56%, and 54.79%, respectively. The accuracy were 73.03%, 61.80%, and 59.55%, respectively, suggesting that the DVE showed highest sensitivity, specificity, and accuracy for enamel caries, whereas for dentinal caries, CR showed highest sensitivity and DVE showed highest specificity and accuracy. Conclusion: The DD exhibited better specificity than sensitivity for enamel lesions and better sensitivity than specificity for lesions into dentin. DD may prove useful as a predictive clinical tool and should only be used in addition to other diagnostic methods such as visual inspection and dental radiographs to avoid false-positive diagnoses. Background: Probiotics are live microorganisms which when administered in adequate amounts confer health benefits on the host. Commonly, most of the organisms ascribed as having probiotic properties belong to the genera Lactobacillus and Bifidobacterium and milk is the most commonly used vehicle. Objectives: The study was aimed at analyzing the biofilm formation by plaque regrowth method upon the usage of a probiotic toothpaste containing Lactobacillus paracasei by measuring the optical density using a spectrophotometer.Materials and Methods: A commercially available probiotic toothpaste, PerioBiotic (spearmint flavored) from the company Designs for Health, has been tested. The toothpaste contains the strain L. paracasei, which has been found to co-aggregate with Streptococcus mutans (MS). The Plaque Glycolysis and Regrowth Method (PGRM) was used for the evaluation of the antimicrobial effects on plaque metabolism in vivo. PGRM is based on the observation that natural fasted dental plaque, sampled from different quadrants of the dentition, exhibits similar metabolic and regrowth properties when suspended at equal “biomass” in standardized media. Conclusion: The results suggest that L. paracasei-based toothpaste, PerioBiotic, is effective in the reduction of MSmonospecies biofilm, but the activity appears short lived when high sucrose exposure is administered. Aim: This study aims to determine and compare the extent of inhibition of demineralization and promotion of remineralization of permanent molar enamel with and without application of three remineralizing agents. Materials and Methods: Forty extracted permanent molars were randomly divided into two groups 1 and 2, longitudinally sectioned into four and divided into subgroups A, B, C, and D. The sections were coated with nail varnish leaving a window of 3 mm × 3 mm. All sections of Group 1 were treated with their respective subgroup-specific agent: Casein phosphopeptide-amorphous calcium phosphate (CPP-ACP) paste for subgroup A, CPP-amorphous calcium phosphate fluoride (ACPF) paste for subgroup B, CPP-ACPF varnish for subgroup C and subgroup D served as a control. The sections were then subjected to demineralization for 12 days following which lesional depth was measured under the stereomicroscope. All the sections of Group 2 were subjected to demineralization for 12 days, examined for lesional depth, then treated with their respective subgroup specific agents and immersed in artificial saliva for 7 days. The sections were then examined again under the stereomicroscope to measure the lesional depth. Results: CPP-ACPF varnish caused significant inhibition of demineralization. All three agents showed significant remineralization of previously demineralized lesions. However, CPP-ACPF varnish showed the greatest remineralization, followed by CPP-ACPF paste and then CPP-ACP paste. Conclusion: This study shows that CPP-ACPF varnish is effective in preventing demineralization as well as promoting remineralization of enamel. Thus, it can be used as an effective preventive measure for pediatric patients where compliance with the use of tooth mousse may be questionable. Background: Mouth rinse that is natural, safe, cost-effective, readily available and culturally acceptable is required as an adjunct to routine tooth brushing to combat dental diseases. The aim of present study was to compare the effectiveness of salt water rinse with chlorhexidine mouth rinse in reducing dental plaque and oral microbial count. Materials and Methods: The Minimum Inhibitory Concentration (MIC) of salt water against S. mutans, L.acidophilus, A. actinomycetemcomitans and P. gingivalis was determined by Macrobroth Dilution method. Thirty participants were randomly allocated into study group (salt water rinse) and control group (chlorhexidine rinse). Baseline DMFS, defs and plaque scores were recorded. Baseline unstimulated saliva samples were collected by spitting method. Oral prophylaxis was done after baseline sample collection. The participants were advised to rinse the allocated mouthrinse for 5 days under the supervision of co- investigator. Pre- rinse (after oral prophylaxis) and Post –rinse (5th day of mouthrinsing) plaque examination and salivary microbial analysis was done. The collected salivary samples were immediately transported and streaked on the respective media for microbial count. Result: MIC of salt water was 0.7 M for S. mutans, A. actinomycetemcomitans and P. gingivalis and 0.8M for L. acidophilus. There was statistically significant reduction in the plaque scores, salivary S. mutans, L. acidophilus, A. actinomycetemcomitans and P. gingivalis count from baseline, pre-rinse to post-rinse in the study group (p=0.001) and control group (p=0.001). Salt water was as effective as chlorhexidine in reducing dental plaque (p = 0.19) and A. actinomycetemcomitans (p = 0.35) count and while chlorhexidine was superior against S. mutans (p = 0.001), L. acidophilus (p = 0.001) and P. gingivalis (p =0.001). Conclusion: Salt water rinse can be used as adjunct to routine mechanical plaque control for prevention of oral diseases. Introduction: Pulpotomy technique is most widely accepted clinical procedure for treating primary teeth with coronal pulp inflammation caused by caries with no involvement of the radicular pulp. Aim and Objective: The aim of the study was to evaluate the success and efficacy of mineral trioxide aggregate (MTA) and antioxidant mix as pulpotomy agents both clinically and radiographically. Materials and Methods: A total of forty primary molars in children aged between 6 and 9 years, requiring for pulpotomy procedures, were selected. Random samples distribution was done, antioxidant mix (n = 20) and MTA (n = 20) both were used as pulpotomy agent. Under rubber dam isolation, pulpotomy procedure was performed in all samples followed by restoration with stainless steel crowns. Later, the patients were recalled after 6 and 12 months for clinical and radiographic evaluation. The data were evaluated using Fisher's exact test. Results: Statistically analysis shows no significant difference between the two groups (P > 0.05) with respect to clinical and radiographic success rate, but antioxidant mix showed more efficient result than MTA. Conclusion: Antioxidant mix pulpotomy is more biocompatible and cost effective than any other commercially available medicament. Aim: This study aimed to compare and evaluate the changes in the salivary flow rate, pH, and buffering capacity before and after chewing casein phosphopeptide-amorphous calcium phosphate (CPP-ACP) and xylitol-containing chewing gums in children. Materials and Methods: Sixty children aged between 8 and 12 years were selected for the study. They were randomly divided into Group 1 (CPP-ACP chewing gum) and Group 2 (xylitol-containing chewing gum) comprising thirty children each. Unstimulated and stimulated saliva samples at 15 and 30 min interval were collected from all children. All the saliva samples were estimated for salivary flow rate, pH, and buffering capacity. 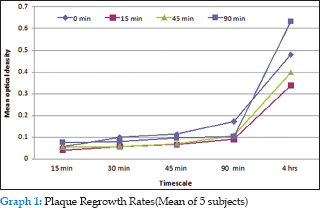 Results: Significant increase in salivary flow rate, pH, and buffering capacity from baseline to immediately after spitting the chewing gum was found in both the study groups. No significant difference was found between the two study groups with respect to salivary flow rate and pH. Intergroup comparison indicated a significant increase in salivary buffer capacity in Group 1 when compared to Group 2. Conclusion: Chewing gums containing CPP-ACP and xylitol can significantly increase the physiochemical properties of saliva. These physiochemical properties of saliva have a definite relation with caries activity in children. 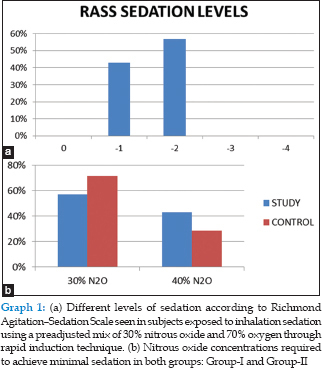 Purpose: To assess the efficacy of nitrous oxide (N2O)-oxygen (O2) inhalation sedation by rapid induction technique using preadjusted mix of 30% N2O and 70% O2 in children. Materials and Methods: Sixty children with a treatment plan which included pulp therapy were recruited for the study. Children categorized 3 and 4 of Frankl behavior rating scale and American Society of Anesthesiologists health status I and II were included for the study. Children were distributed into study group (Group-I) and control group (Group-II) by fishbowl randomization. Children in Group-I were induced inhalation sedation using a preadjusted mix of 30% N2O and 70% O2 through rapid induction technique, and children in Group-II were exposed to inhalation sedation by conventional slow induction technique. Parameters such as least oxygen saturation, sedation levels by Richmond Agitation–Sedation Scale, time taken to achieve ideal sedation, maximum N2O concentrations used, and adverse events were recorded and evaluated for each procedure. Data were analyzed using independent sample t-test and Chi-square tests. Results: Analysis of data showed statistically significant difference between both groups in time taken to achieve ideal sedation (P < 0.001). No significant difference was seen in incidence of hypoxia (P < 0.512), maximum N2O concentrations used (P < 0.118), and occurrence of any adverse events. Conclusion: None of the children from both groups exhibited hypoxia. Sense of detachment was seen in one child each from both groups. Rapid induction by preadjusted mix resulted in ideal sedation in 57% children of the Group-I; rest had achieved these levels at 40% N2O. There was a significant difference in the time taken to achieve ideal sedation by rapid induction which was almost half the time taken with slow induction. Objectives: The aim of this study was to evaluate the clinical and radiographic success of zinc oxide-ozonated oil (ZnO-OO), modified 3Mix antibiotic paste, and Vitapex in treatment of primary molars requiring pulpectomy. Methods: Sixty-four primary molars of forty three children aged between 4 and 8 years with pulpally involved primary molars requiring root canal procedures were treated with ZnO-OO, modified 3Mix-MP paste, and Vitapex. The subjects were followed up clinically at 1, 6, and 12 months whereas radiographically at 6 and 12 months, respectively. Results: The results showed that the clinical and radiographic success rates of ZnO-OO and Vitapex over 12 months period of observation were 100% whereas, for modified 3Mix-MP paste, the results were 95.8% and 79.2%, respectively. Conclusion: On the basis of the overall success rates of all the three medicaments, following order of performance can be inferred clinical success and radiographical success:- ZnO-OO = Vitapex > modified 3MIX-MP paste. Context: Oral health care for children with special needs remains largely unmet. It is important that we should focus on preventive strategies for special children to help curtail and prevent oral diseases. Aim: This study aimed to assess the effect of visual pedagogy and probiotic mouth rinse on the periodontal health of hearing impaired children. Materials and Methodology: The study cohort consisted of twenty children with hearing impairment (HI) and 20 age-matched healthy children. The gingival index (GI), plaque index (PI), and salivary pH for all children were assessed at baseline, 15 days after oral hygiene training using visual pedagogy, 15 days after probiotic mouth rinse introduction, and at the end of the test period, i.e., 2 months after discontinuing probiotics. Statistical Analysis: Comparison of means was carried out using the Student's t-test. Intragroup parameters were assessed using the one-way ANOVA, followed by the post hoc Scheffe test. Value for statistical significance was fixed at 0.05. Results: The GI and PI scores did not improve significantly after oral hygiene training in either of the two groups. The use of probiotic mouth rinse significantly reduced GI scores (<0.01) and PI scores (<0.01) and increased salivary pH above the critical pH in both groups. Conclusion: The use of visual pedagogy coupled with probiotic mouth rinsing may improve the periodontal status of children with HI and should be explored as a preventive procedure for children with special health-care needs. Introduction: Dental caries is one of the most common preventable childhood infections. a number of measures are available to prevent occlusal caries; pit and fissure sealants are one of the various methods currently available to cost effectively reduce dental caries. Aim: To evaluate the retention of pit and fissure sealant bonded using sixth (Adper promt), seventh (Optibond) and eighth (Futurabond Dual Cure) generations of adhesives. Settings and Design: A total of 37 healthy children who fulfilled the inclusion were randomly selected. A total of 148 teeth (4 in each subject) were used as samples for the study. Methods and Material: The teeth to be sealed were then isolated using rubber dam. The placement of adhesives was done using split mouth design. The first permanent molars were randomly divided into four groups on the basis of sealant placed without and with using 6th, 7th and 8th generation bonding agents as follows: GROUP A (N=37):- Pit and fissure sealant placed without bonding agent. GROUP B (N=37):- Pit and fissure sealant placed following sixth generation bonding agent (ADPER PROMT). GROUP C (N=37):- Pit and fissure sealant placed following seventh generation bonding agent. (OPTIBOND). GROUP D (N=37):- Pit and fissure sealant placed following eighth generation bonding agent. (FUTURA BOND DUAL CURE). The integrity of the sealant placed was assessed immediately after completion of the procedure, 3 months and 6 months after placement. The post-operative evaluation for retention was done using Simonsen criteria. A score of 0 was given for complete retention, 1 for partial retention and 2 for no retention. Statistical analysis used: The statistical analysis was done using SPSS (Statistical Package for Social Sciences) software version 21. Results: It was found that there was no statistically significant difference between the groups after 3 and 6 months as the value obtained (0.133) was much greater than the p-value (0.05). 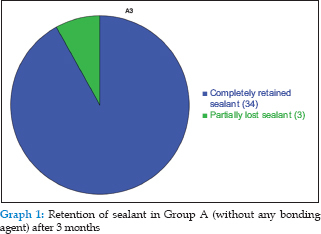 Conclusions: This study concluded that the use of bonding agent prior to application of pit and fissure sealant does not necessarily aid in retention of sealant as compared to pit and fissure sealant placed without bonding agent, Sealants effectiveness is directly related to its retention and it dependent on application procedures. The failure of retention of pit and fissure sealants can attribute to moisture contamination, improper curing methods, inadequate adhesion, improper application procedure or early age placement. 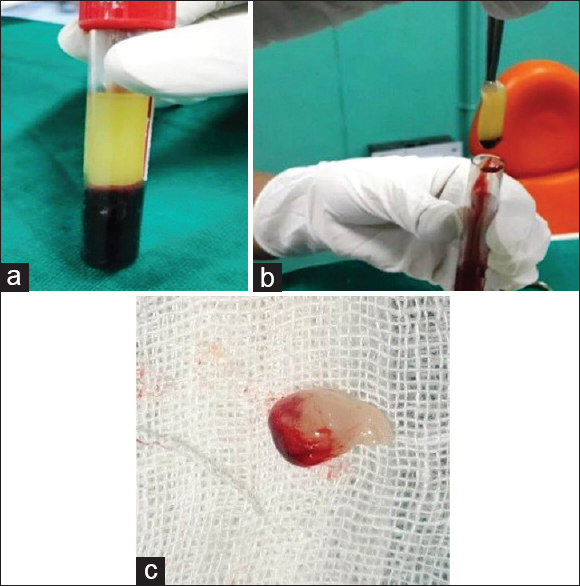 Aim: This study aimed to evaluate and compare the Platelet-rich fibrin (PRF) and Mineral trioxide aggregate (MTA) as a pulpotomy agent in primary molars. Material and Methods: In this study, 50 primary molars from 50 healthy children aged 5–9 years requiring pulpotomy were randomly allocated into two groups. 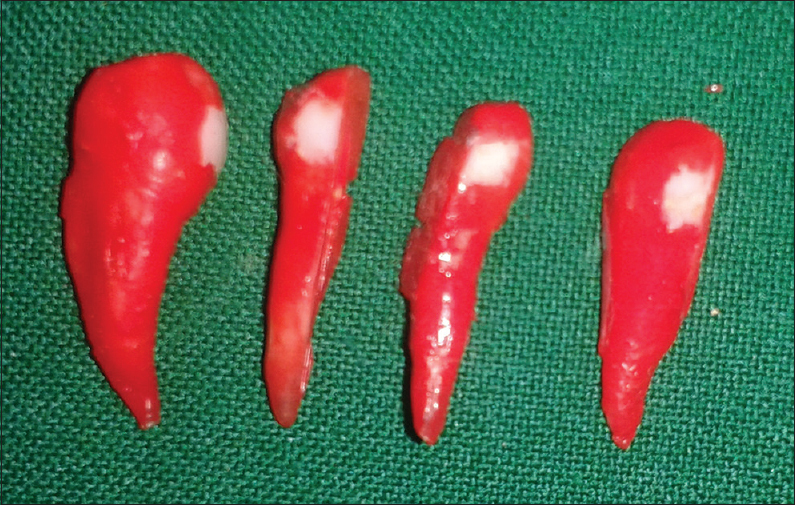 In PRF group, after coronal pulp removal and hemostasis, remaining pulp tissue was covered with PRF preparation. In the MTA group, the pulp stumps were covered with MTA (Pro Root MTA-Root Canal Repair Material, Dentsply International Inc.) paste obtained by mixing MTA powder with sterile water at a 3:1 powder to water ratio. All teeth were restored with reinforced zinc oxide eugenol base and glass – ionomer cement. Stainless steel crowns were given in both groups 24 h after treatment. Clinical evaluation was undertaken at 1, 3, and 6 months intervals whereas radiographic evaluation of the treated teeth was carried out at the interval of 6 months. Results: By the end of 6 months, the overall success rate was 90% in PRF group and 92% in MTA Group. A statistically significant difference was observed between the groups at 6 months of follow-up (P < 0.05). The results were statistically nonsignificant between the groups (P > 0.05). Conclusion: Radiographic and clinical outcome in PRF group could suggest it as an acceptable alternative in pulpotomy of primary teeth. PRF holds a promising future in the area of primary tooth vital pulp therapy. Multiple supernumerary teeth are rare developmental anomalies which are often associated with syndromes. Only few examples of nonsyndromic supernumerary teeth have been reported with fourth, fifth, sixth, and seventh molar rarest of all. The cause, frequency, complications, and surgical operation of supernumerary teeth are always interesting subjects for study and research. 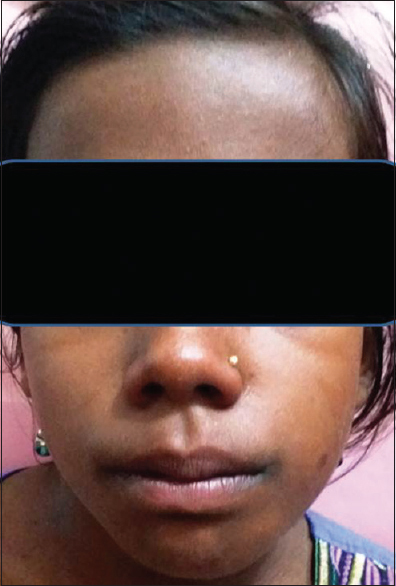 Literature reports increased occurrence of the supernumeraries in the maxilla, but here, a unique and unusual case report of 12-year-old female patient with unilateral multiple impacted supernumerary teeth in the mandible in otherwise healthy individual has been presented. Treatment of nonvital immature permanent teeth with calcium hydroxide is associated with few difficulties such as weakened tooth root, root canal reinfection, and long treatment time. Mineral trioxide aggregate (MTA) apical plug method is an alternative treatment method for open apices and has gained popularity in the recent times. 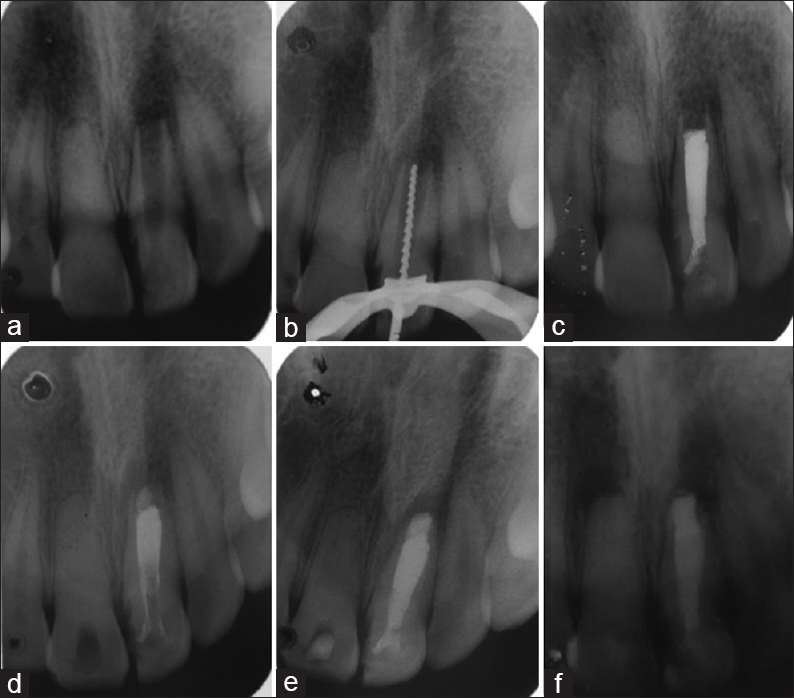 This case report describes the management of a late-referral case of periapically involved, traumatized immature permanent incisor by endodontic treatment and the use of MTA apical plug. After preparing the access cavity, the working length was determined. The root canals were irrigated with 3% sodium hypochlorite and disinfected with metapex for 2 weeks. MTA was then placed in the apical 3 mm of the root canal. The remaining part of the root canal was filled with thermoplastic gutta-percha, and the coronal restoration was finished with composite resin. After 1-year follow-up, radiograph showed successful healing of periradicular radiolucency. Bruxism is a sleep disorder characterized by grinding and biting teeth with multifactorial etiology, resulting in deleterious effects on teeth, periodontium, and temporomandibular joint. There is a lack of scientific evidence evaluating the effectiveness of medicines in treating this parafunction. The present case report was drafted under the rules of CARE checklist. An 8-year-old male patient with sleep bruxism and associated symptoms received a combined homeopathic therapy of Phytolacca decandra 12c and Melissa officinalis 12c for 2 months. After this period of combined homeopathic therapy, the bruxism and associated symptoms completely disappeared. After 2 years of clinical follow-ups, the patient had no recurrences. The use of homeopathic therapy was successful and should be seen as an alternative to treat sleep bruxism and its associated symptoms in children. Enamel microabrasion is a noninvasive method that removes intrinsic and superficial defects from teeth aimed to improve dental esthetic with minimal loss of dental tissue. 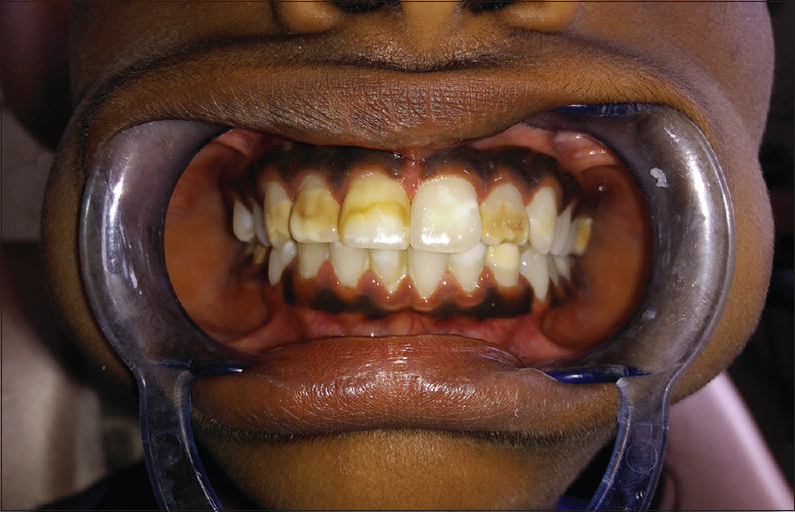 This case presentation describes the attempt for teeth color correction utilizing that conservative technique in a young girl whose maxillary anterior teeth presented an opaque white/brown stain. Along with microabrasion, an innovative approach of application of casein phosphopeptide-amorphous calcium phosphate crème on the tooth, and remineralization was carried out thereby reducing postoperative sensitivity of the treated tooth. Based on the results of this case report, it can be concluded that this technique is efficient and can be considered a minimally invasive procedure.